Last major update issued on September 25, 2004 at 03:55 UTC. 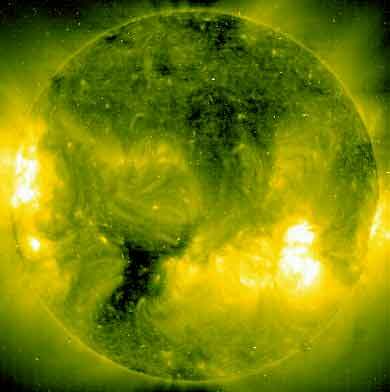 The geomagnetic field was quiet to unsettled on September 24. Solar wind speed ranged between 376 and 441 km/sec. Solar flux measured at 20h UTC on 2.8 GHz was 89.4. The planetary A index was 6 (STAR Ap - based on the mean of three hour interval ap indices: 7.9). Three hour interval K indices: 32122222 (planetary), 22121221 (Boulder). Region 10673 decayed slowly and quietly, all trailing spots disappeared. September 22-24: No obviously earth directed CMEs observed in limited LASCO data set. No obvious coronal holes are currently approaching geoeffective positions. 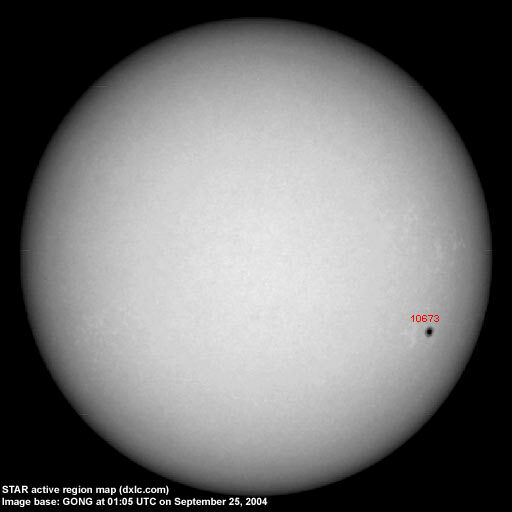 There is a large coronal hole in the northern hemisphere, however, its southward extension does not appear to reach far enough south to become geoeeffective. The geomagnetic field is expected to be quiet on September 25-27. A recurrent coronal hole flow could arrive on September 27, however, currently available images do not indicate the presence of a geoeffective coronal hole. Long distance low and medium frequency (below 2 MHz) propagation along east-west paths over high and upper middle latitudes is poor. Propagation along long distance north-south paths is poor. Trans Atlantic propagation conditions are monitored every night on 1470 kHz. Dominant station tonight: Radio Vibración (Venezuela) with a very weak signal. The best signals were from CJYQ on 930, VOCM on 590 and Greenland on 650 (a good indication of improving conditions) kHz. Otherwise only a few stations from North America were noted during the night.